Our roast lunches are a special of the day, served with mini Yorkshire puds, stuffing balls, roast potatoes, seasonal roast root veg and seasonal steamed greens, smothered in homemade onion gravy. There is a soup of the day too and a selection of cakes! 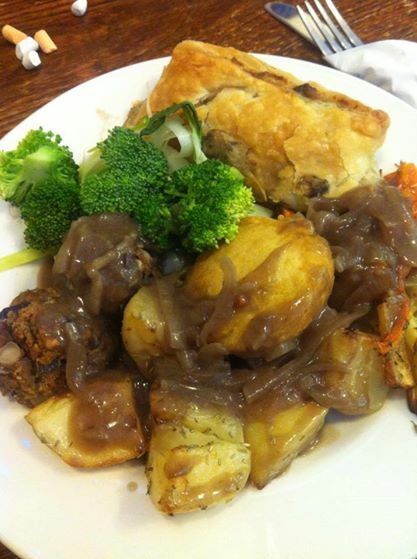 Remember – most of our ingredients are organic, too, making it the yummiest roastie in town! Booking is advised, especially if you are a large group or planning to come later in the afternoon. * We have live music most weekends, however there are usually tables away from the music if you want quiet – please let us know when you book. ** All roasties are suitable for vegans, too!